I once visited a restaurant with a long rant printed on the menu about the difference between "homemade" and "home style". That was a long time ago, and I still can't help but think that menu writer was obsessed with the pedantic. Julie's Cafe has the words "Home Style" front and center on their sign, and I can't help but observe that nearly everything inside seemed to be homemade. 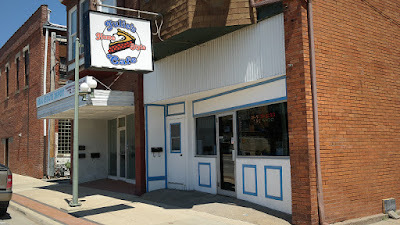 Location: 216 S Market in Oskaloosa about sixty miles from Des Moines. Directions: Market St in Highway 63 just south of the main drag through Oskaloosa. 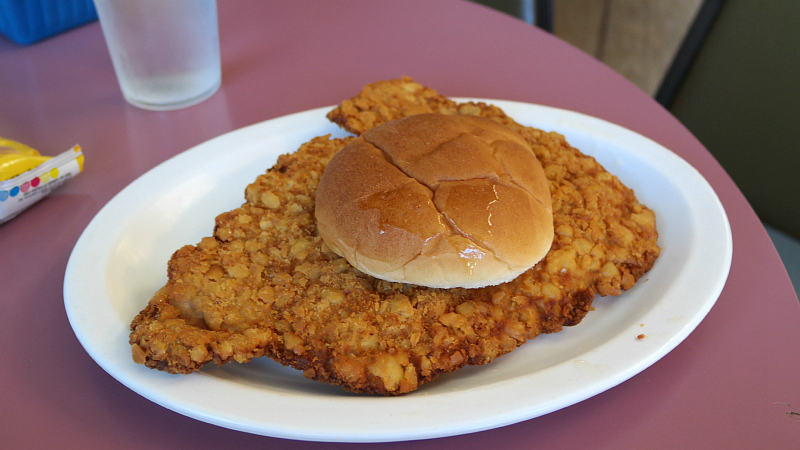 The Tenderloin: This was the classic triangle shaped loin cut pounded out to cover and entire lunch plate. The thin meat had lost nearly all moisture. The breading had some good seasoning and crunch but with no chewy meat inside. 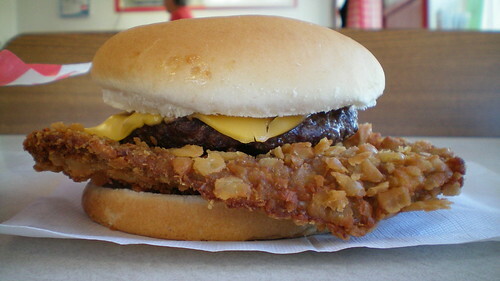 The bun was like a diner roll and hadn't been toasted. Overall 7.3 out of ten. Price: $5.00 with a bag of chips. 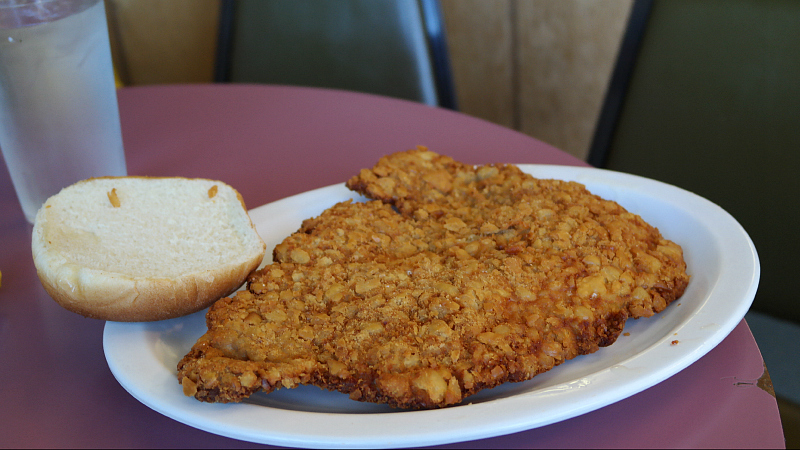 Also on the menu: the lunch menu is hot beef and tenderloins and a daily special then a dessert board. 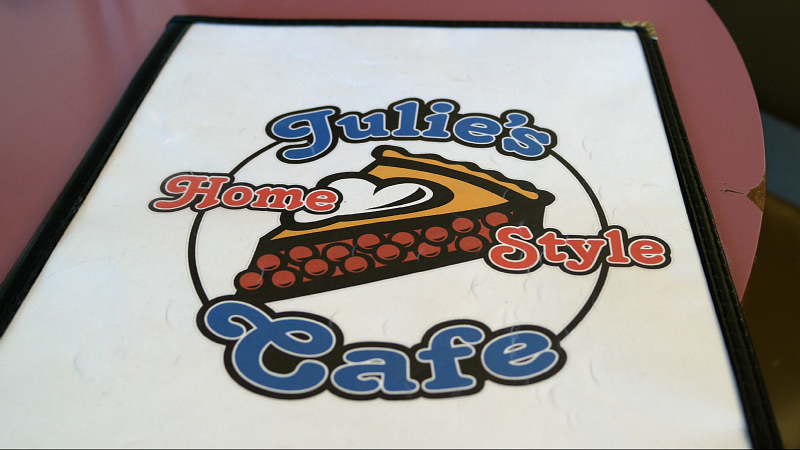 The breakfast menu includes bowls of cereal and the classic diner eggs and bacon breakfasts. Service: It was table service when I stopped in for lunch. I should not that they are only open until 1:30 on weekdays and close after breakfast at ten on Saturday. Ambiance: This is an old diner that hasn't been redone in a long time with wood paneling and an old counter and booths for seating. 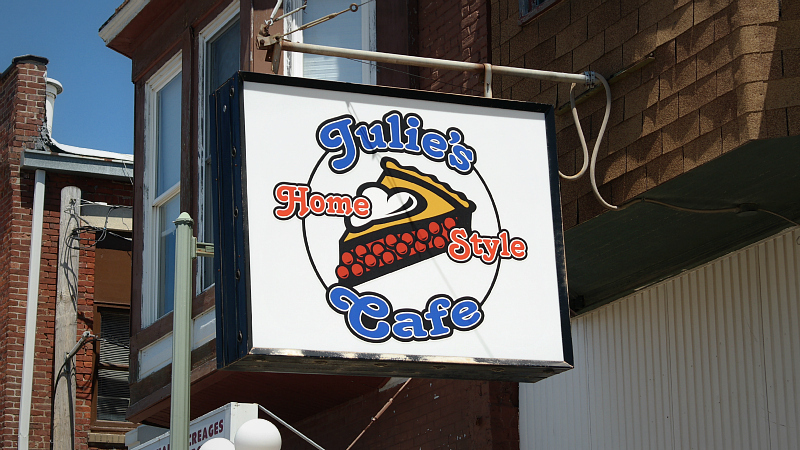 Final thoughts: The signage and uniforms for Julie's Cafe seem to emphasize the hot beef sandwich and the pies. I think I would try one of those next time I am in Oskaloosa. This place seems to attract lots of locals for its breakfasts too.